a visit to the Heritage Center, not quite long enough, and then on to Mairi’s sister and brother-in-law who are building a fantastic new house with ongoing legal access problems hopefully coming to a conclusion. Confirms my bus theory that a few decades ago a bus toured through the Highlands and Islands and dropped off awkward customers in every community. Awkward is a pejorative term as other words spring to mind. Sarah and Yorick are coming to the end of a long and protracted access dispute with a neighbour. A strainer placed in front of an access point with no other purpose than to prevent access. while Yorick puts the house together. Amazing workmanship and dedication while having to go to court with the neighbour. As it is still going on I better not say too much other than wonder why people go down that road which seems to be based in such awkward bad neighbourliness. Another fine evening’s worth of Applecross seafood was produced and an evening of music was in the air. Being part of the community was apparent from early on when Eric dropped in and added to the “Big Archie” story. He certainly seems to be a colourful character. Calling in to the Heritage Centre where we met Murray, who turned up for the music session later, and then on down to Mairi’s relatives. It all appears that we are making contact with the community rather than a fleeting sightseeing visit. Maybe I am too aware of the numbers that come through Applecross and just stop at the Inn before hurriedly going on their way. Having Mairi chat away about who everyone was gives a more substantive view of the island. The visitors here do not seem to be out of keeping with the numbers living in the community and I only met two groups of tourists on bikes when I travelled down to the south end. Distinct similarities to Applecross emerge all the time. The land is very similar although there is none of the regimented plantations, there are lovely native tree groves that are abundant with bird life. There are far more cattle and sheep on the ground, although sheep do seem to dominate the landscape. The population does seem to be slightly younger but some do need help in the sheep gathering and keeps the younger members of the community very active. The west theme of having several jobs is manifest here on the island. whistles, piano, a couple of songs and a bit of craic. Could not help thinking of ancient times, of many ceilidhs, of tales told, songs sung and tunes played. No one taking the lead but a natural flow and rhythm to the evening. It was only till later I discovered that Big Archie dropped in for a wee dram. He caught up with Mairi in the kitchen before taking his leave. So much packed into just one day. mainly to get rid of the mud, power increased back up to 90Kwhs and a welcome couple of Crabbies to finish a very long day. Not before getting my hand crushed by a Bantry Bay Irishman saying keep up all your campaigning, it will come good. Seems he is battling his government over their attempt to harvest seaweed in Bantry Bay on an industrial scale. Why do authorities keep expanding industries that outgrow their environments, our salmon farming comes to mind. Export figures come before longterm sustainability. doing the door most nights now to give the Boss a well-earned break. For me it is a lot easier coming from home or the sea to organise front of house. Would not be quite so keen if I was there day and night. Wednesday evening was finished of with some fine box playing by Ali from Inverness, originally Caithness. He has and is still playing with Addie Harper, both Senior and Junior. Thursday evening saw another visit from Tarnybackle and they went down a storm, always good to get a wee catchup with John’s fine version of Caledonia, our version of the Irish Spancil Hill.The Inn that night was full all night, example being the seventeen geographers from Hamburg University. They loved the Inn, the music and everything about the night. Hug from the organiser, reminding me of the many compliments and even more hugs from customers who leave after saying what a friendly place it is, the food amazing and the atmosphere second to none. The Catalonians who have visited could not be more friendly, especially when we talk nationhood, resulting in yet another leaving hug, Karen’s German Mum completing a fine warm series of shifts. So satisfying when customers leave with such a strongly felt welcome that they come up to you to shake hands or give you a hug, it is a testament to every one who works at the Inn. The previous Thursday it was a bunch of HillBillies playing and again busy night. Feeling like the media tart from Toscaig at the moment. It all started on Tuesday with Olivia who was travelling with a group of 21, mainly, landscape architects from across Europe with a Prof from Edinburgh. talking fishing and trying to talk her through why the establishment allows our waters to be degraded so much by the trawl and dredge. A view from the outside and she just could not understand why we have allowed ourselves to be dictated to by such a small group of fishers. Unfortunately due to Brexit one of the principles the Federation used up till now, Article 17, will now fall by the wayside, which is a fairer distribution of wealth amongst fishermen. Chatted about the NEF New Deal and the No Growth economy. I do not want to keep growing, I am happy to stay small to work within the environment I am fortunate to live in. From then it was on to Paul, working up a photographic essay for Reuters News Agency who came out on Monday on a rainy and breezy day. Hauled a couple of fleets of creels that was pure pleasure on seeing the quantity and quality of langoustines in them. Although the female egg carriers are appearing more and more in the creels the landed catch is still looking as good as it has done over the last 15 years. He did seem to enjoy himself and said he found it all very interesting, especially the sustainable side to the job. Lots of photos taken and I saw him in the Inn enjoying a fish pie before heading off to photograph Ewen and head up to Assynt and some gamekeepers. From there it was at the Inn and an interview with the BBC Travel Show about the effects of the NC500. And Applecross Ices got a mention as well. but luckily inside has Jolene. More and more the different angles to the NC500 are coming to the fore, having turned into a road trip is proving, I think a mistake. There is so much more to the Highlands than this mad scramble to do 500 miles in a week or in some daft cases a day. The last media event of the day was being interviewed by the BBC Travel Show, an interview that, ironically was stopped several times by a five car convoy, two camper vans and a screaming toddler in a push chair. I may not have said what the anti NC500 folk wanted to hear but pointed out that although Applecross has changed it is not all bad…..in fact I find little that is. Standing outside the Inn looking across the Bay I saw the Sand track and was reminded of my mother on a BSA250 going along it carrying out her district nursing duties post war. Yes, you can argue everything has changed here beyond recognition, but I can still walk up that track and meet no one, take time out and draw in the awesome scenery from miles around. Maybe the change is that the folks had little opportunity to take that time out as they were closer to subsistence living. I know that things were not easy when my Dad grew up here and he regarded me coming back as a failure as he was unable to achieve his ambitions due to family loyalties. The NC500 has turned Applecross into a pit stop on a track, but over time those who follow TV and Ad campaigns and tick boxes may find a new box to tick and those who have taken time to find the real Applecross will come to further explore its Spiritual qualities that I come across every day. on the way out. Never like “just steaming” and have to be doing something. The last fleet of seven just hauled and was kept on board to take ashore for a wash when things went awry. I had previously picked up one of my own ropes, cut, respliced it and dropped it over the side before finishing my fleet. Turned to go home when I heard the sound of rope in propeller. Bit puzzled as I had all my rope on board but then realised that it was the other rope that I had spliced had caught either on my sounder or the keel and then went into the prop. Bar tight and tried to get clear again by putting into gear and hoping the rope cutter on the prop shaft would do the job. Unfortunately what happened was like putting a winch pull on the gearbox which smashed the centre of the drive plate and pulled out of the bell housing. It was still just engaging so hooked rope, onto the creel hauler to cut free and engage gear but too much and complete breakdown. Nothing for it but to call for assistance and DJ on the Grace Anne was the recipient, coming across from Raasay, a fair bit to the south, but rope on and an hour and a half later we were back on the moorings, grateful for the help. When a little younger fretting about lost time and expense would always kick in but now there is too much to do. Showered and up to the Inn where the Boss was taking the evening off so it was Linda and myself out front. A good night and all the tables enjoyed themselves, so many people are just a little sad in leaving and I have attended more than a few “last suppers”. New group have been in at least twice, live in London but were so complimentary about amazing food and friendliness. Phone call to our resident engineer, Ewen, to explain my plight and arrange an early morning visit to the Varuna. I think it is fair to say bad enough but could have been worse, always have in mind the Ivanhoe which was lost in Portree Sound with a rope in the prop, tried to remove it by thrashing the engine revs and ended up cracking the stern gland and sinking. Last thing before coming ashore yesterday was checking any water intake which was nill. What I have never done is to raise the revs to try and free any ropes, just not worth it, enough damage without doing that. followed by a lift to the Van Hospital out side Lochcarron. The lift almost came too soon as everything was stunning, more than a little hint of autumn. while Steve was laying the first of the pipes. A few more lengths to go but the speeds they are working at….no problem, so thinks Dougal. Gravel sand mix arrived and I nipped half way back up, well quarter of the way, to see where they wanted the load dropped. knackered by this times and have settled for a couple of bacon and egg rolls, a cracking mug of Peruvian coffee and The Elephant Sessions playing in the background. One or two wee rumours suggesting they may be heading this way. So I should be cheesed off, down but what ever switch was flicked about three months ago is still on and a wood cut is on the cards for the afternoon. (written yesterday afternoon.) Two ways of looking at events, could mope about a four figure bill and four figure loss of revenue or think that I have a bit of time in the next week or so to catch up in so many things. Dougal and Eilidh are getting plenty of exercise with all the coming and going. Little time to read about supposed rogue helicopters landing on the shore outside the Inn. Some one put something up on YouTube and it was picked up by the press, a no news day. Good response from the Boss. Been on the Ardhu Pier for a fair bit over the last couple of days mending creels. The headphones on and lost in the music of Rura, Treacherous, Lone Bellow and others Dave from Oban startled me somewhat. Turns out he was here to change over the Succorfish unit that appears not to be up to scratch. The Sand receiver was only picking me up about 4 miles from the Base which is not really much use. The new VesperMarine unit will put us on the AIS traffic map. A new safety measure if nothing else and if used properly can cut down on gear conflict as there should be no hiding place for trawlers towing through creels. Ended up mending a whole fleet and putting most of it back together on board with the intention of doing little today. 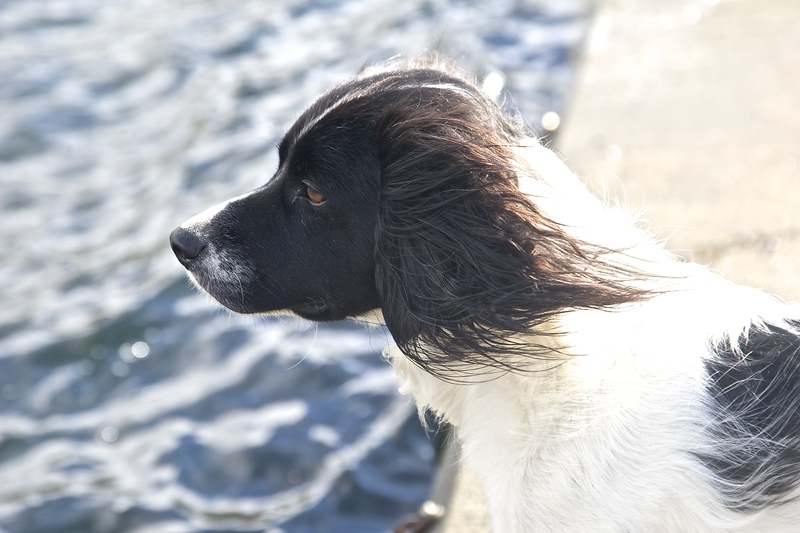 Dougal looking regally into the north wind. Later he is wandering about in the seaweed looking for crabs. Often wonder why when one starts work at the Inn that maybe not as fresh as you could be at the beginning of a shift and then you remember that you’ve done most of a days work before you start. An uneventful shift and with both nations schools back the pressure has eased somewhat. An uneventful evening until the very, very drunk lady on table 2 managed to throw up on the floor, before being led out by her partner. Bit embarrassing for anyone in their thirties to behave like that. The Boss went into action and everything was sorted out apart from the two tables out of action for the rest of the night. Saw a Facebook posting a little later and realised that she was still performing but now in some ones house. They had taken the wrong turning and appeared in a local’s house semi hysterical and was duly thrown out of there. I think her best move would have been to turn up at the Inn in the morning and offer a fair sum to one of the charity boxes for all the hassle she caused but it was not to be. One of the rare occasions where it will be a one-off visit to Applecross. Still queueing for tables but under control and waits are not too long. Even home before eleven. Getting some good sleeps in on these north wind days. Another day of strong northerlies and after a slow start it was back on the bike and in the company of Dougal and Eilidh we were back down on the Pier mending the next fleet. Have become a little OCD with the creels and grouping the fleets all the same colours, white, green and black. Makes sense as most will be the same age and deteriorate together. The second fleet ashore now been mended with only a dozen of them to be washed before going back to sea. As you mend away, like hauling the creels, you think about anything and everything. Today the image of the wee boy lying drowned on the Turkish shore filled my thoughts. The politics around the image and general situation is being fiercely argued over but I feel compelled to put down some random thoughts. That wee boy had a mum and dad, maybe brothers and cousins but they felt forced to leave their home and try to make for a safer haven. We will never know what awful deeds drove those people to such a desperate situation. Went back to a conversation I had last night at the Inn with a Niseach and we were talking about subsistence living of previous generations in the Highlands and we cannot easily grasp how harsh conditions were for those folk not that long ago. My grandfather came from Leac a Li to the Crowlin Islands at the turn of the 20th century and thought they were a step up from south-east Harris. The Macleods did not even have a croft so an island that only just supports a 100 odd sheep nowadays must have seemed like “this will do”. They moved in a time of peace unlike those refugees we are seeing now. The daily grind of survival is alien to me standing on a pier mending creels, supplying a niche market for a comfortable living, plenty of clothes on and well fed so not feeling the biting north wind, company of my dogs, but easily connecting the trials of my predecessors with those displaced by the actions of madmen. Look around Applecross and you see half the houses are empty, our own house now has two empty bedrooms, there are 65000 acres here that have not enough space to build one affordable house, and then back to that beach. There must be some better way to live our lives. There is space from Applecross to the Borders that could be used to help prevent pictures of little boys lying drowned on foreign beaches. So many people are feeling so inadequate just now. That wee boy will never be a dad….thoughts while mending creels…. Another shift at the Inn calls and unsure whether to post this. Will see after the shift. Seeing twitter and fb timelines that are full of shock at the photo. Puts so much into perspective in our safe and comfortable lives.